← Oregon! We made it! News from Rusty aka Three Feathers! Bridget and Spike lie on the bench seat in the Perfect Tow Vehicle. They’re waiting for me to finish breaking camp at Clyde Holliday State Park near John Day, Oregon. They know the routine so well that they’re already in a travel state of mind, ready to nap while I drive us to who knows where. Actually I do know where. We’re going west to Ochoco Divide Campground. Fellow blogger Jim Melvin of http://www.jimbosjourneys.com is camp hosting there. I met Jim months ago when he drove his LazyDaze Class C through Elephant Butte, New Mexico. I make a final check that everything’s as it should be for travel when my phone rings. It’s Rusty! 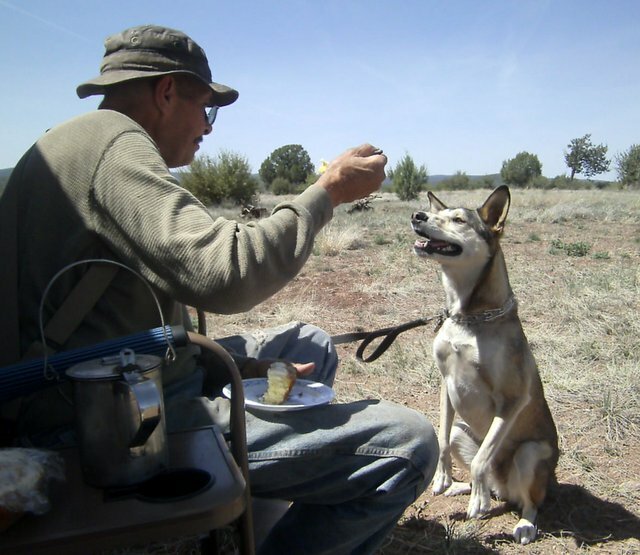 I met Rusty while we both boondocked at Ash Fork, Arizona, last spring. At first I referred to him as “the camo man” because his truck with camper body is painted in camouflage. I soon learned his given name is Rusty, but for most of his adult life he’s been known as Three Feathers, the mountain man. Rusty starts a tale that I immediately sense is not going to have a happy ending. The sadness of the situation overwhelms me. All I can come up with is “I’m so sorry,” which is no help. Rusty starts to cry, choking out the sobs. My heart aches to hear the pain coming from my gentle friend. I try to comfort him. We talk for a few minutes, updating each other on where we’ve been. Rusty had some more bad luck. “The differential went out on my truck when I got back to Flagstaff. I got it fixed. At least now I don’t have to be pouring oil in my truck all the time.” He tells me about his new phone and that he’s saving to get a trailer. “I’m going to get a seven by seven by twelve cargo trailer and then, of course, fix it up right. I can get one for fifteen hundred dollars.” On and on we go, covering several topics. He perks up at the mention of Oregon. “Make sure you go to Sisters. And look for Round Lake. It’s at the base of Three Jacks Mountain.” His voice has the tone of someone remembering home. I tell him I’m on my way to Sisters and he’s pleased to hear that. I know how the conversation will end. This entry was posted in Simple living and tagged Arizona, Ash Fork, camping, Clyde Holliday, John Day, Ochoco Divide, Oregon, RVing, Sisters. Bookmark the permalink. 83 Responses to News from Rusty aka Three Feathers! My heart aches for Rusty. And I do believe Timber is ok somewhere. I have to. It’s difficult for me to imagine Rusty without Timber at his side. So sorry to hear this!! I hope the next dog he gets will be a blue heeler…ours WOULD not leave!! Never ran off from us all the 16.5 years we had her!! Some dog breeds are just so prone to wander off…others not… Poor guy!! Thanks for the update and hope your next camp will be a fun one for you and the doggies!! Of course, I can’t help but relate this to my crew. Bridget is like your blue heeler. She would never leave. She’s always makes sure she knows where I am at all times. Spike, however, gets in his own zone and wanders so I have to keep him under watch. Might be some difference between males and females too…we have had mostly females. Sue, I was so thrilled to read the title and looked forward to getting an update on Rusty. But what a heartbreaking thing to happen to such a good, gentle person. Hope he gets his trailer so he can enjoy a safer, more comfortable home. And thanks so much for the update, even though I wish — how I wish — that he still had Timber with him. Maybe someone will see the photo and they can be miraculously reunited. I was thrilled, too, when I realized the call was from Rusty, and then…. oh, what sad news! The good news is Rusty’s health is good — hasn’t always been so — and he’s looking to the future. Nice to hear from Rusty but so sad to hear about Timber, who probably has another good home. You’re gonna’ love the Cascades. Jim’s been telling me about places to camp. They do sound beautiful, as is the place we’re in now! I read a News story about “America’s Mailbox“ though was of interest. MY heart goes out to Rusty and his loss of his boy Timber. Reading this tonight comes straight after hearing that my daughter’s little dog Lilly was put to sleep this afternoon when she took a turn for the worse after battling cardiac failure for the past 2 years. I was only with my daughter and her Lilly this afternoon when we spent such a happy day riding our horses in the glorious sunshine after a week of wet and cold. Wish I had given her an extra cuddle not knowing I would not be seeing her again. Our wonderful mobile vet came to the house and put her to sleep. I can just imagine the sorrow in that house hold tonight………………rest dear Lilly we loved you so. I’m sorry you and your family are going through this painful time, Glenda. Your Lilly obviously enjoyed her life with lots of love. I wish my story today had been more of a distraction for you, instead another reminder how our love for an animal can bring such hurt. Such a sad story but yet so sweet…. Rusty is holding on to the hope that Timber will miraculously appear, despite the miles. I guess it’s a stage of grieving, but wouldn’t it be wonderful. Sue, I agree with other readers to see such a beautiful dog alongside the road, out in the middle of nowhere, I suspect they picked him up. I also suspect they may have called the local animal control and left a message that he has been ‘found’ to find his owner. If Rusty doesn’t claim Timber, they’ll probably keep him or find a good home for him. We are so sorry to hear that Rusty is missing Timber. Anyone who has had a pet companion can relate to his heartbreak. Posting his story along with the information of his last whereabouts may result in a reconnection. The power of the internet is remarkable and miracles do happen. Glad he has his vehicle fixed and is looking forward to purchasing a trailer. Wishing you safe travels. Can’t wait to see what Sisters is all about. Crying for Rusty and Timber both. That’s a sad thing to hear! I’m glad that Rusty was able to give you God’s blessing in spite of his pain. Perhaps there will be another dog who needs Rusty. I was wondering if you ever hear from Rusty. I had been thinking about him. It hurt really bad when you lose a member of your family and that’s what they are. My four legged babies are all the kids I have and I love them very much. This is the first time I have ever been saddened by one of your posts. When I read the title, I was overjoyed you had contact with Three Feathers again. So sad about Timber. This is a reminder for folks on the road to get your dog microchipped! Only $45.00 and worth every penny! If you know you will not have constant verifiable contact information, use a relative who can contact you if your lost pet has been found! My heart goes out to Three Feathers and I certainly hope Timber does find him and they can travel the back roads together once again. It has happened before, it could happen again! Sorry to hear about Rusty. I really enjoyed your time with Rusty and Timber. I think Rusty’s story is not over and there will be good news this winter when you meet again… I’ll be waiting and reading. I wept for Rusty. That is the most painful and terrible thing. If you speak to him again soon, will you tell him about my William? It might comfort him a little. William was found wandering and taken to a shelter, and after a few in-between steps he came to me. He was young and strong then, could scale a six-foot fence with ease, and couldn’t think of anything else when he was chasing a squirrel. I’ve always thought his original person must have been traveling, because nobody would leave such a wonderful dog unclaimed. We’ve grown old together, and I can’t tell you how much joy he has given me. I sometimes think of his original people and feel so sorry for them. I think that is probably what is going on with Timber. I know thinking of it won’t fill the gap in Rusty’s life, but it might ease his heart. Thank you, Jeff. Right now we’re waiting to identify a dog that might possibly be Timber. If it isn’t, we will use your link. Sad to hear that Timber is missing and that Rusty is heartbroken. Doesn’t say if Timber was microchipped…hopefully he is. Microchipping is cheaper at the low cost clinics. $15.00. Peace of mind…because you never know what might spook your pal! Collars with tags can come off. July was not that long ago…………hopefully he’s checking with the animal shelters in that area. Most have online searches. 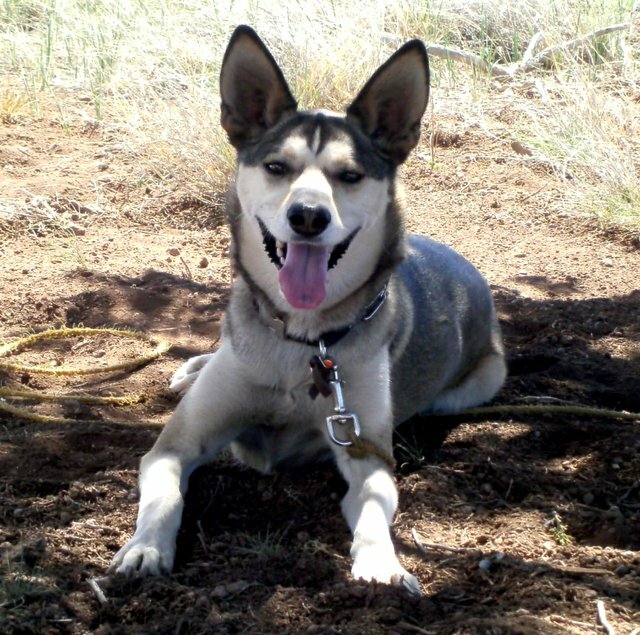 When I checked it my heart dropped as there is a pic of husky..cept she is a female. Doesn’t say what Timber is crossed with…please look at Lost/Found pet #31253. Sometimes the people at Animal Control guess as to what one’s breed may be. My internet connection is terrible and cell phone service is spotty. It took 45 min. to get this comment written. IF ANYBODY THINKS THEY’VE LOCATED TIMBER, PLEASE ASK THE PEOPLE HOLDING HIM TO LOOK AT THE PHOTO ON MY TODAY’S BLOG TO MAKE A POSITIVE ID. I’ll do what i can, but I can’t do much with no phone and hardly any internet. I will keep trying to look at the links posted in the comments. So far they won’t open for me. Also, Rusty can’t check links. He doesn’t have a laptop or internet. Thanks for any help you can give. Okay ,I didn’t know if Rusty had the capabilities. I checked both websites and compared the pictures. One, the #31253 dog ,doesn’t have a picture. I’ll call both numbers..and will get back to you. No need to call about dog #338762. I got a call through to the lady, she looked at Timber’s pic and said it might be him. She is sending me photos of the dog her father found so I can hopefully identify. The man took the dog to California and Canada. It is now in Boulder, Colorado! I will let you know any further info. okay, I just got off the phone with her….also. She said you guys were in contact and working it out. The shelter South Utah Valley Animal Shelter is closed. M-F 9-6 Sat 9-1. 801-851-4080. Depending on what transpires with the lady…I will call the shelter tomorrow. Oh please let her father have Timber! Fingers crossed..toes too! cinandjules, thank you soooo much! I was really hoping someone could help and you certainly are! Thanks again! It’s all about our four legged companions….they are part of the family. If I was Rusty, I would be devastated. Can’t wait to hear back from Sue! PS can’t tell you how hard it was to explain WHO I was to this lady. Short story is I follow rvsue and crew and one of their friends is missing his dog……….blah blah..oh sue I just got off the phone with her! DOG #31253… the one at the So. Utah Valley Shelter is described as a RED dog. Timber is grey, white, and black, of course. Rusty must be so lonesome. How sad for him. So glad that he felt so comfortable with you that he was able to call and talk about it. I am sure you brought him a little peace. I’m wondering if he checked the animal shelter in Loa. Someone may have found the dog and taken it there. Just now saw the post above. He should call them – sometimes the descriptions/breeds aren’t that accurate. Chinle, Please read my answer to cinandjules above. Thanks. I don’t have phone or steady connectivity. RE; POSSIBLE LOCATION OF TIMBER . . . I’m still waiting for the email with the photos. It may be a while. I don’t know if she has to go get the photos from her father or if she has to take pictures first. I’m using Jim Melvin’s WiFi to stay online. If Timber turns out to be the dog in Boulder, that would be wonderful..Let me know if you need Colorado help. I live about 3 hours from there. Dear, dear Mary . . . My eyes teared up when I read your offer. We shouldn’t get our hopes up, but it’s hard not to! RVSue’s friends are the best ever!!!! Thank you Mary! Everybody, keep visualizing and praying Timber as found!!! I would like to remind people with pets how important it is to have them micro-chipped. That is one of the first things a vet, SPCA, or other dog rescue groups will check when a stray animal is brought in. I know we all think that our pets will never get lost, run away, etc. There are just too many situations that can come up. They also make tags that lay on the collar, not dangle down, that you can put a contact number on. Don’t mean to sound preachy, just hate to see animals lost. We have one of our rescued cocker spaniels because he was found running the streets with no info of any kind. We got him, literally, an hour before he was to be put down. This is just wonderful Sue, so many people trying to reunite Rusty and Timber. I was thinking if Timber just had a collar and Rusty a cell phone, someone would call if they’d found him. I’d find it mighty hard to leave an area having had my best friend disappear. I’d be waiting and waiting to see if he would return. I had a beagle once that I now think was taken. We lived in the country and one day she didn’t come back for dinner as she had for YEARS. She was about 12 at the time. She was gone for 3 months and then one day she turned up tired and dirty. Wherever she had been she didn’t say but it was clear she had worked hard to find her way home. Not sure I’ve ever had a happier day. Really hoping for such joy for Rusty and Timber. Hi, Sherry…. Timber wears a harness because he’s a pretty rambunctious dog with a lot of energy and he’s strong! I suspect that Rusty took the harness off so Timber could sleep comfortably. If Rusty hadn’t been debilitated by the smoke, he would have taken Timber out on a leash. That’s what he did when we camped near each other. Rusty is not a very robust person any more. I imagine he couldn’t breathe that smoke any more. It was so bad for me and the crew, I had to run us out of Montana and Idaho (and I don’t have respiratory problems!). Your beagle story is heartwarming. I love beagles but I avoid looking at their sweet faces because they often run away following a scent. What a happy reunion that must have been. He couldn’t breath due to the smoke…………..he looked, called out to no avail…he had no choice. Rusty prolly feels guilty HAVING to leave without his Timber. Great news! Read comment below. Sue, your readers are awesome. I sure hope someone finds Timber and can return him to Rusty. Yes, my readers are wonderful! I know! Me, too! I’m sitting here watching the envelope icon at the top of the monitor, waiting for the email with photos. Dinner is on hold………..in this neck of the woods! I received an email with three photos. As best I can tell, it’s Timber. I called Rusty to give him the number of the lady and her father who have the dog in Boulder. I told him not to get his hopes up. The lady said the dog responded to the name Timber and they think it is the same dog. Unfortunately the cell connection kept breaking up so I couldn’t explain the whole story of this dog to Rusty. I’ll keep you informed. I’m going to climb a small hill here at the campground to try and pick up a stronger cell signal. No, thanks to YOU for writing your blog. We are SO excited! IF it turns out to be Timber, and I think it will, I would love to see the reunion. Give Rusty our best! Tell him…life just got better! I love today’s technology, look what it can do. And some people think blogs are frivolous. Keeping my fingers crossed. Hope it all works out. Would like to second the comment above about getting your pet microchipped – not that expensive (I paid $50 each) and that is the first thing a shelter will look for. Keep your number up to date with the microchip people also. I have my cats chipped, too. Sue you are amazing and wonderful and so are all the great people on this blog. It shows that there are still nice people around who care about all creatures, large and small. I hope this is Rusty’s Timber and that they are reunited soon. I hope your post brings a lead for Timber’s whereabouts and that Mr. Rusty’s heart ache is lessened and his journey takes a turn for the better! What a wonderful link about his life…I bet he is a wonderful storyteller…very cool! Five *****’s Three Feathers!! The crew and I climbed the hill so we could get cell signal to call Rusty. My first call interrupted his conversation with the man in Boulder who has the dog. I called a few minutes later and spoke with Rusty and he says IT IS TIMBER!!! No doubt about it! Rusty and Jay, the man who found Timber, talked about arrangements to get Timber back to Arizona. I’ll post the details in my next blog entry. Thanks to everyone for the tears, prayers, and excellent sleuthing! Now I have to give my crew some attention! Rusty is absolutely ecstatic! It was wonderful to hear him happy again … more later. Now on the serious side……Reading you blog on Camo man (April 2012 not 2011) does Rusty have the means of traveling back to get Timber? IF not, I would be happy to donate the first $100 toward gas. Anybody else in? Please keep me informed of any money that’s required to get this reunion accomplished. I don’t have a lot of money but I’m willing to do what I can to help. You can get my email address from RV Sue, I think. I would chip in (no pun intended), $25 to have Timber microchipped. That’s great news!! I sure hope it works out! If the guy who found Timber took him into Canada, he had to spend some cash to get his shots all current. Sounds like a very cool person. Yes, we took him to Canada on a trip to visit family. He was a great traveler, we have some neat photos. We did have to get him shots and a health certificate in order to go. Bless you and your Dad, Daisy. You’ll have to make a little photo album for Rusty so he can see Timber’s “vacation” pics. What a story, complete with fairy tale ending. After RV repairs last month, we are caught short this month….. maybe after my SS check arrives!! I would love to be able to donate! I’m just so proud of everybody on RVSue’s blog for coming together with technical expertise, prayers and general good will for making all this happen! From tears of sadness to tears of joy! What a day! The sun is setting here in the Adirondack Mts of New York. Dinner is on. Have to give my critters some attention because they just don’t understand why mom spent all day on the computer. Glad it worked out and there is a happy reunion in the near future. What great detective work. Thank you for making this happen. With all the sad news we hear daily, this story will certainly be one we can all treasure the end and rejoice. Wow, tears of sorrow, tears of joy. What a dynamic blog you have Sue. What wonderful followers. WOW, what a story!! The internet does help with some great things sometimes!! So glad it is Timber. I was heartbroken when I read the blog….remembering Rick and Timber….Then there were glimmers of hope as the post came in Now I am in tears…thank the Lord for you, My Dear Sister, your fanastic followers and everyone who had a part in finding Timber. I shouted out loud..”.YES!!!!!! Yes!!!! !, Thank you Lord” and then the tears started as I celebrate with all of you. There is no way I can reply to all these emotional comments! You know how you can get a headache from holding back too many tears? I don’t want to cry and I don’t want one of those headaches! Ha! What a wonderful development! I so appreciate everyone who participated in this drama . . . and I thought this was going to be a lil ol’ rving blog. We have Timber!! He’s known to us as Willy, and we have been looking for his owner. Now, all we need is help transporting him from Colorado to Arizona. Some background, Sue saw our ad on Fido finder.com.. She called and I looked at the photos of timber on her blog. The photos were so much like Willy that I was pretty certain it the same dog. Susan’s comment about Willy being intelligent was the deal cincher. My dad found Willy when Willy came to visit his dogs when he was camping. They searched for Willys owner, and found where Willy had been sleeping. He had gone out and found water bottles, brought them back, bit into them, and licked the water out to survive. Willy was all skin and bones, no coller. My dad hiked all around the area, looking for other campers. He did not find anyone. He couldn’t just leave Willy there, so he took him with him. He went to the ranger station and the store and could not find any signs. My dad was on his way to California to see his dying mother in the hospital. He did not want to leave Willt at a shelter as Willy was such a nice dog that he didn’t want to think about him being euthanized or adopted without being able to find his owner. He made it to California in time to see his mother before she passed away. She was an animal lover, and the family asked for all donations to go to the ASCPA or local shelter. We are so happy that we are able to reunite Willy with his owner. Thanks Sue for helping Rusty out! First let me offer my prayers for your recent loss. I am happy that your Dad was able see his Mom before she passed away. You are kind people with kind hearts and you will be repaid many times for your unselfish act. There is a beautiful message here for all of us. First and foremost….our sincere condolences to your entire family regarding your recent loss. We spoke for a minute yesterday. Me trying to explain the whole situation was probably confusing to you. Thank god Sue had talked to you before I did. Whew….glad it worked out. Thank you for rescuing and taking care of Willy/Timber. From the pictures it looks like he is comfortable on the bed with the little boy and became a part of your family. I hope it won’t be too hard on the little guy when he leaves for AZ. Again thanks for caring and taking the steps to find his owner. I’m in too….let us know where to send the $$ for all the travel expenses. May goodness shadow all those involved last the few days…love it that there are so many good souls out there! I had been wondering what had become of Rusty. Really enjoyed your stories about him. What a roller coaster ride this post and the comments have taken me on. So pleased there is a happy ending. Can’t people be wonderful, and isn’t it great to be part of a happy ending? Here’s something you might like in Oregon….free camping and volunteering at a lighthouse in September!